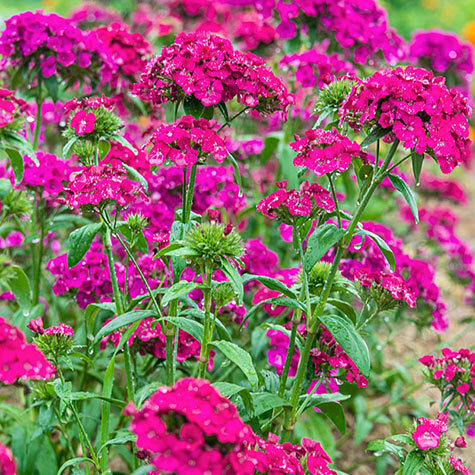 Amazon Neon duo Dianthus | Gurney's Seed & Nursery Co.
An absolute showstopper in our flower trials, Amazon's magenta and fuchsia blooms appear to glow, attracting both admiring eyes and butterflies from all around! Growing from 18-30 inches tall, it's the perfect hardy annual. Depth: Light is required for germination. Cover seed with a medium layer of coarse vermiculite at sowing. 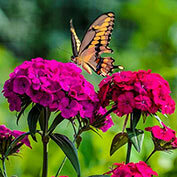 Seed takes 3-4 days to germinate at 64-68 F.
Color: Magenta and fuchsia blooms. Foliage: Very attractive narrow dark green glossy leaves. Germination: 3 - 4 days. 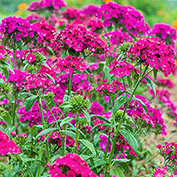 Flower Form: Large clusters of serrated-edged, bright flowers. Comments: An absolute showstopper in our flower trials, Amazon's magenta and fuchsia blooms appear to glow, attracting both admiring eyes and butterflies from all around! Growing from 18-30 inches tall, it's the perfect hardy annual.